We always enjoy the Sandown weekend as it marks the beginning of the V8 endurance season and with that it brings a few additional challenges with some of our drivers doing double duty in the V8 Supercars. This year MR 'Super Coach' Luffy was doing double duty looking after MR's Carrera Cup Drivers as well as co-driving with Garth Tander for the Holden Racing Team. 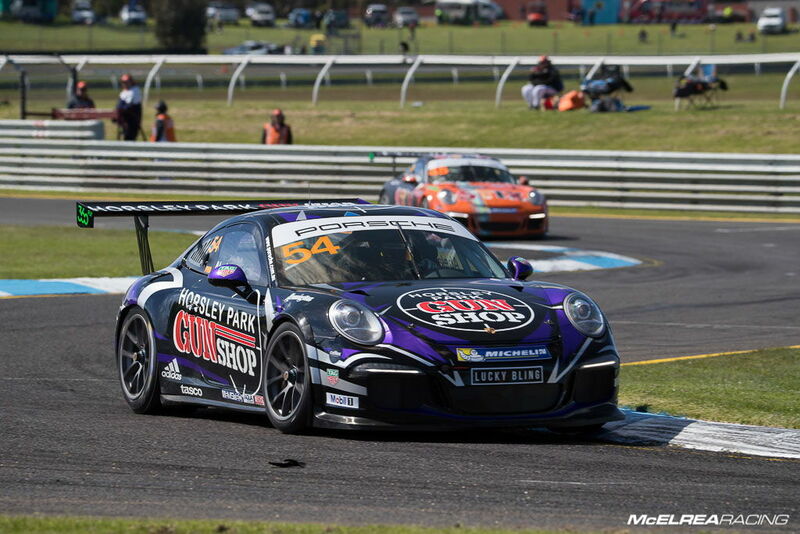 Matt Campbell was also doing his debut V8 race driving in both the Nuveau Constructions Porsche and the Nissan V8 Supercar with Todd Kelly. Matt was able to claim his fifth straight pole of the season, just one behind the legend Jim Richards. Notably Matt also set a new qualifying lap record. At the start of race one he released the clutch fractionally too fast and got excessive wheel spin allowing McBride to lead at turn 1. He kept intense pressure on Nick until a small mistake allowed Matt to pass under brakes into turn 1 on lap 11 of 16. In race two Matt got a great start and led McBride into turn 1. 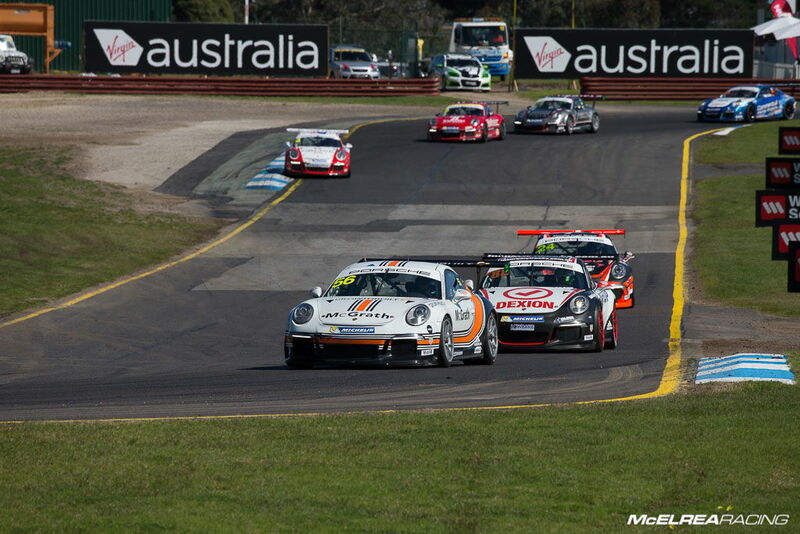 After a safety car period and Matt lead Alex Davison to the flag. In race 3 Matt started on the damp left hand side of the track and was third into turn 1. On the second lap he started to experience gearshift issues leaving the car stuck in 3rd gear and had to retire. Shane qualified second in Tag Heuer Challenge (for semi-professional drivers). In race 1 Shane got a cracker start and on the opening lap got ahead of pole-sitter Bates. He was in an excellent rhythm and pulling away from Bates when rookie Pro driver O'Keeffe spun in front of him and made unavoidable contact breaking a radiator forcing a non-finish (DNF). In race 2 he had to start from rear of grid and had an uneventful race finally finishing 6th. In race 3 Shane got a good start and was very happy with the handling balance of his car to charge back through to 2nd for an outstanding comeback. Duvashen qualified well to finish in 9th. 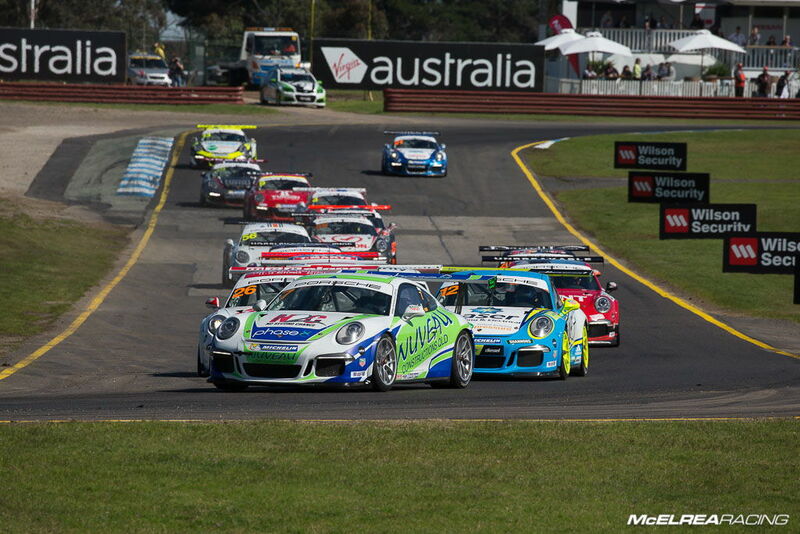 In race 1 he had a good start but lost a couple of spots in the congestion at turn 1. He raced with team mate James for a few laps until a gearbox issue slowed his progress and he cruised to the finish. 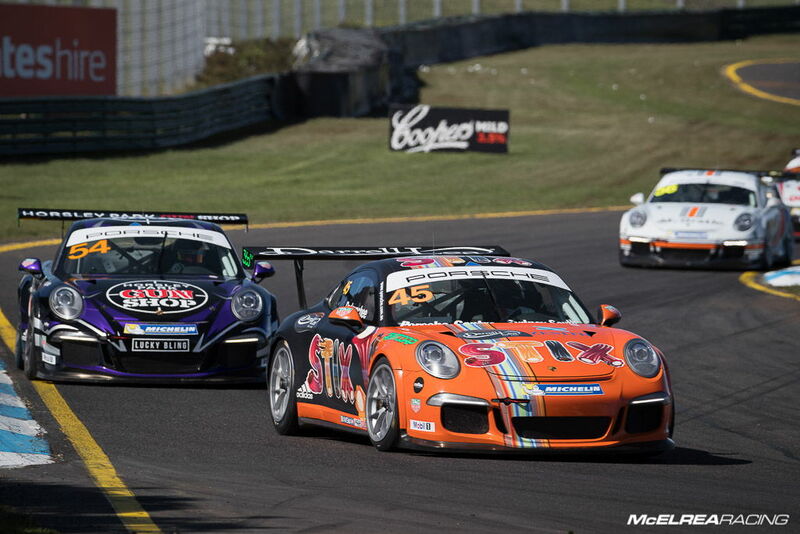 In race two he started 9th avoided any dramas, and drove steadily to progress up to 7th by the finish. In race 3 like Matt and James, he also started on the damp left hand side, got wheel spin and had to defend into turn 1. Once he got past Bates he was matching the lap times of the cars ahead but was too far back to bridge the gap. Still he had a solid weekend and finished 7th on points for the weekend. James qualified 13th in Pro class. In race 1 he did a great job to make plenty of decisive passes, stay out of trouble and to get up to 8th by the end. In race two he was doing an excellent job until locking the rear wheels under hard braking at turn 11 and having a big moment but called on his renowned car control to 'hang on to it' and not quite spin. He recovered well and got back up to 9th by the chequered flag. In race 3 James started on the damp left side of the track and got an average start like everyone on the left side of the track. He was determined to finish the race with a straight car so took a cautious approach passing slower cars, eventually finishing the race in 11th and 8th in Pro class for the weekend. Well it's been a long time since we didn't have a Carrera Cup driver on the podium so that fact alone makes it look like a bad weekend, but pole and two outright race wins doesn't really relegate the weekend to the recycle bin! Shane's DNF cost him the opportunity to be leading the Tag Heuer Challenge Championship, but he is only 49.5 points adrift with 360 points still available. James had another strong weekend learning plenty and racing with the front group. 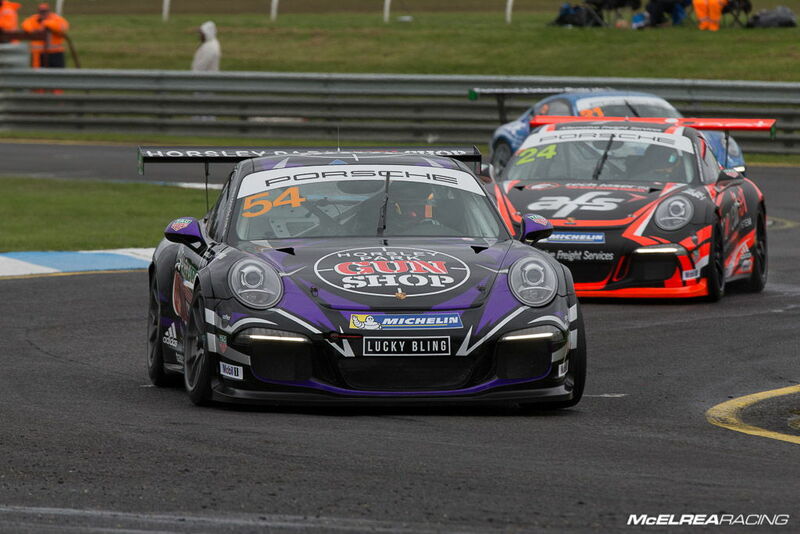 Duvashen had a better weekend than the last few Carrera Cup rounds. The gearbox problem for Matt cost him a race and a valuable 60 points, which reduces his Championship lead back to 37.5 points. Still a handy lead but, it could have been much better! The awesome MR crew has two weeks to get our cars fully prepared, get on top of Matt and Duvashen's gearbox issues and head to the incomparable Mt Panorama at Bathurst for the penultimate round.